in stitch pattern after blocking. Looking for a quick and easy project? 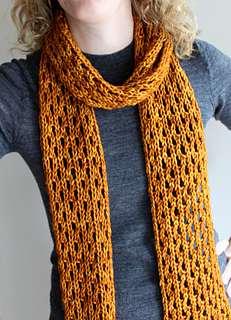 This long skinny scarf incorporates a quick and easy to memorize lace stitch pattern using only knit, purl, yarn over, and k2tog stitches. It works up quickly in an aran or bulky weight yarn on large needles. 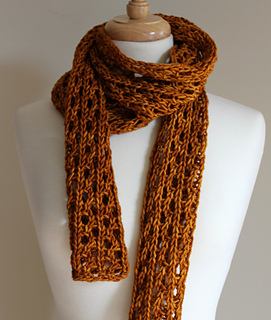 Finish one in a day, make several for gifts, or make a few for yourself in various colours! 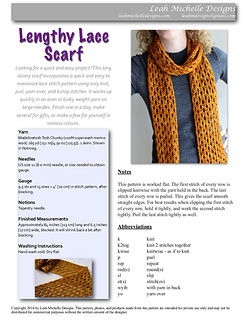 This pattern may be purchased individually or as part of an ebook set with the Bulky Lace Cowl pattern. This pattern is worked flat and uses a slipped stitch technique to create smooth clean edges. 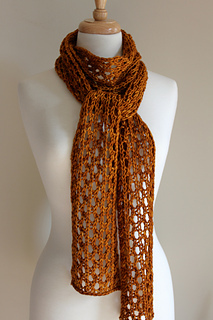 The lace pattern looks great from both sides making the scarf reversible. Pattern includes notes, a list of abbreviations, and the stitch pattern is both written and charted. The finished size is approximately 84 inches (213 cm) long and 6.5 inches (17 cm) wide, blocked. It will shrink back a bit after blocking. It uses one entire skein of Tosh Chunky. The colour shown here is Nutmeg. This easy pattern uses only these stitches: k, p, yo, k2tog, sl1.